With another drone scare bringing a major airport to a standstill and the longest federal government shutdown in U.S. history impacting critical operations, 2019 has been off to a rough start for aviation security. On January 22, air-traffic controllers suspended flights at Newark Liberty International Airport in New Jersey after two passenger planes reported unmanned aerial vehicles in their airspace. “We missed the drone by about 30 feet off our right wing,” radioed a United Airlines pilot, minutes after a Southwest Airlines flight had reported a sighting nearby. Although the precautionary stoppage lasted for less than an hour, it happened at a peak travel time at the nation’s 11th busiest airport, and the ripple effects were far-reaching. Forty-three flights were forced to hold off their arrival, nine of which were diverted to other airports, and 170 other flights headed to Newark from airports around the country were delayed on the ground. The disruption came just two weeks after a similar event at Heathrow Airport in London, and a month after repeated drone sightings shut down London’s Gatwick Airport for 36 hours, canceling or diverting about 1,000 flights and stranding or delaying 140,000 passengers. These incidents are only the latest to demonstrate the growing threat that drones pose to our vital infrastructure. Despite Federal Aviation Administration guidelines that drones must stay at least 5 miles away from an airport and below an altitude of 400 feet, pilots reported at least 2,000 sightings in the first three quarters of 2018 alone. That’s likely to increase this year as drones continue to gain popularity. Earlier this month, the U.S. Department of Transportation proposed a series of regulatory changes to smooth the way for commercial drone use, including eliminating federal requirements that users obtain permission to fly over populated areas or operate at night. At the same time, drones are gaining recognition as potential weapons; in a decision welcomed by LAAPOA last year, Congress gave the departments of Justice and Homeland Security new powers to disable or destroy drones that pose a security threat. The government is also working on measures to track drones and identify their users in real time, but those are years away from becoming a reality. 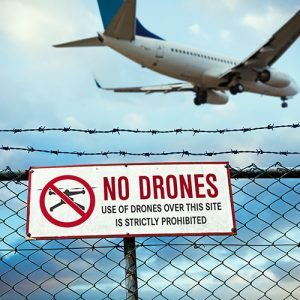 In the meantime, unless further action is taken to protect airports and passengers, drone sightings and near-misses (or worse) may be the new normal for air travel. In the same week, Newark was also among the many airports across the U.S. suffering from long security lines and flight delays resulting from the federal government shutdown that began December 22. On January 25, the day federal workers were scheduled to miss their second paycheck and hours before President Trump announced a deal to temporarily reopen the government, about 250 flights were delayed at Newark because of staffing shortages at several East Coast air-traffic control centers. That morning, the FAA issued a ground stop at New York’s LaGuardia Airport, delaying about 500 flights for an average of nearly 90 minutes, and air travel was snarled in Philadelphia, Orlando, Atlanta and beyond. For over a month, air traffic controllers and Transportation Security Administration screeners had worked without pay while many other federal employees — including FAA safety inspectors and engineers — were furloughed. As the shutdown dragged on, as many as one in 10 TSA workers called out sick due to financial hardship and low morale. Some security checkpoints had to be closed and reserve workers were flown in to staff affected airports. Not only did this cause headaches for travelers, but experts also expressed concern that fallout from the shutdown was severely damaging both air travel safety and airport security, and that terrorists might exploit this perceived weakness. Five former Homeland Security secretaries drafted a letter urging the president and Congress to “restore the funding necessary to ensure our homeland remains safe and that the Department’s critical national security functions continue without compromise.” The unions representing air traffic controllers, pilots and flight attendants warned in a joint statement, “In our risk-averse industry, we cannot even calculate the level of risk currently at play, nor predict the point at which the entire system will break. It is unprecedented.” Thankfully, the federal standoff has ended before the direst possibilities were realized. But with an agreement in place to fund the government for just three weeks, only time will tell whether the situation will repeat itself.